Invite guests to raise their glasses to love, then set them down on these cute little coasters! 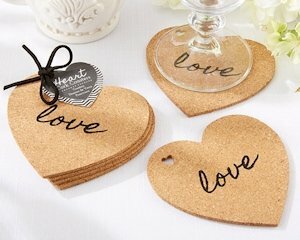 Crafted from cork with the word "love" written in black script, each set of four coasters includes a heart-shaped hole punched through the top left corner. We use these holes to tie each set of four together with a leather cord tie that includes a coordinated black-and-white heart shaped hang tag.